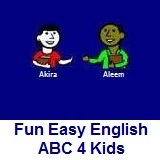 ﻿ Fun Easy English - new writing english alphabet for kids letter k.
Hey kids, try writing the letter K.
Flying a kite during the summer is fun. I use keys to get into my house. There is a knife next to the spoon.